What do you do when you have ugly carpet in place, and there isn’t a possibility of having it removed? This may seem obvious, but it is a step many overlook. Have you seen the rugs available to consumers? Whatever your style or taste, there is an area rug for you. Measure your room and start shopping – you can change the ambiance of your room quite easily and add a new color or cover up what you dislike the most. Sometimes a dingy color on your walls only emphasizes the problem on your floors. Brighten your walls, and you can temper a carpet’s color to make it less noticeable. You can also extend up and paint your ceiling to make everything pop. Instead of sticking with your current decor, add more texture from the floor up. How about adding side tables made from different materials? Or trading out different hues to bring more depth to the room? If your eye moves away from the carpet and focuses on the other items in your room, you’re less likely to think of your ugly carpet. Are all four walls the same color? Change it up by adding a splash of color to one wall. Or accent it with wallpaper, adding in texture and design. It will draw the eye up to the bold pattern rather than leaving your eyes on the floor. 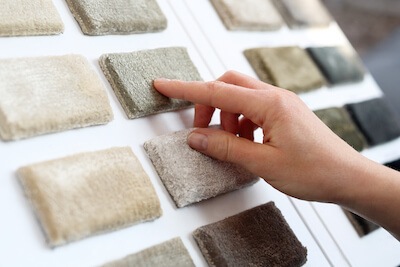 Maybe now is the time you replace that old, ugly carpeting once and for all.